Valentino Rossi must feel like Tiger Woods sometimes. Not only because both get to fret about how to spend a kajillion dollars, but because they're so much better than their competition that anything but a win is considered a bad day at the office. Rossi hadn't won in, oh, all of seven GPs, which in the eyes of some MotoGP fans meant he's washed up. 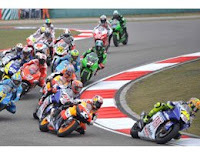 Well, Vale passed Dani Pedrosa on the 4th lap at Shanghai Saturday (May 4th) and motored off for his 62nd win at the pinnacle of motorcycle roadracing worldwide (that's not counting his 125cc and 250cc wins). Reigning champ Casey Stoner was 3rd. The Yank contingent finished 6th (Hayden), 7th (Edwards) and 14th (Hopkins). Edwards was a surprise pole winner, but an early off-road excursion dropped him out of the running for a podium. Rossi is now two points behind 2nd place Jorge Lorenzo, who finished 4th despite fracturing his ankle in a practice crash on Friday, and only nine behind 1st place Pedrosa. Something tells me Rossi isn't ready for the rockin' chair quite yet.